I've been considering a new Trooper for a while and a deal for a new motor home came up and I have to go to Tuscon AZ to get it. My son will end up with it, so he's going down with me to get it, and since I have to pass through Phoenix, I decided to stop and get one. It will be Blue, have a winch, canvas top, overhead lights(not installed) and I'm having them put General Grabber AT2 tires on it, including the spare. Looking forward to trying it out. What a way to solve my problems!!!! Hi Jeff the new trooper are nice i will talk to Brandon about your trooper.They come with new rear differential and C/V axles.Just make sure you take it easy for about 100 miles.Change oil after about 5 miles and than a few times up to 100 miles.Best of luck with your new Trooper. Thanks for that advice, 5 miles, seems like a waste of oil, but I suppose you're probably right. I have rebuilt a lot of of motors and seen a lot of metail flacks in the oil .Ask them for a few oil filters.Spoke to Branden and he is checking every thing twice. I will probably put the old one up for sale after a while, I'll be picking the new 2015 Blue Trooper up this coming Wednesday, in addition to what I said earlier, I'm getting the upgraded shocks and Brandon says it has the wider fenders, I like that. 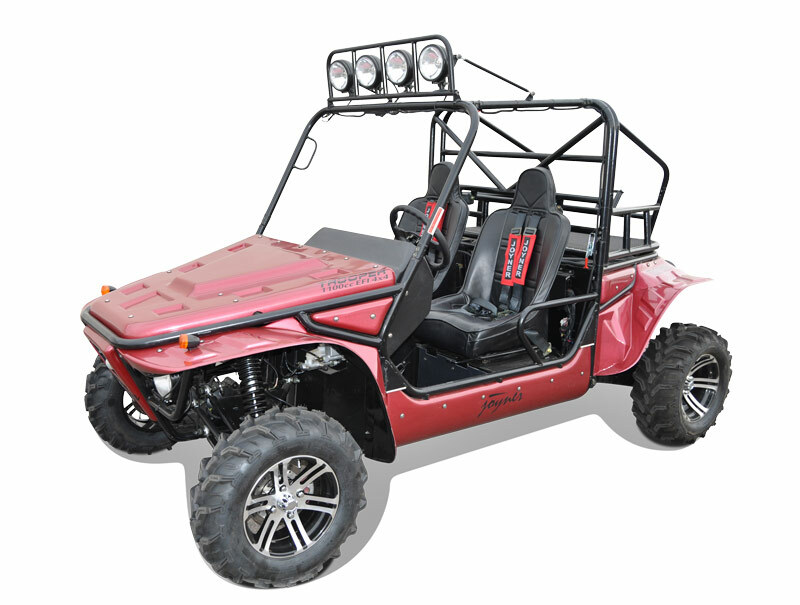 The new Trooper has a lot of up grads .You get the most bang for the buck.I do not sell buggy's but just check out whats out their.The price for a RZR is 20,000 +++ and up some people spend 27,000 i speak to then every week and they tell me how good they are .You have to ether have to much money or just stumped.Rzr are great but before you leave the show room you could have bought a Nissan Altima.No disrespect just a thought. My son has an RZR 800, my friend has a Can-Am Commander and I can't even drive either one of them because of my handicap, I'm 6'4" and they're both too tight for me, I can't get my foot from the gas to brake, and after listening the the constant drone of the two cylinder motor all day, ick. And the Trooper is roomier. Have you ever had to remove all the string from a blown belt? it's a mess and you have to disassemble the clutch to get it out. The engine in the Can-Am is between the passenger and driver and it makes the foot well HOT. They both came with windshields, so they were both dusty, fixed later, but the Trooper was dusty too when I put a windshield in it. I like the 4 cylinder and clutch too, plus the style of the Trooper. Oh yea, I have over 20,000 Km on it and I do think with decent maintenance, it's still good for another 20,000, and they weren't easy miles. Here's the story, my brother took this motor home down to trade in on a camper trailer and I had already asked if he wanted to sell it, so he said I could have it for what they were going to give him for it, great deal, If I didn't like it, I knew i could sell it for probably twice what I paid for it, and since I had to go through Phoenix and I wanted a new Trooper, why not get it at the same time? I walked around it taking pictures for future reference and I'm putting them in google drive so I can share them. I got the Yearben shock upgrade and they are sooooo much better the what I had. The way this motor has performed shows me how bad my 2008 motor is, it's only got 22000+ kilometer on it. Had to replace my trailer tires when I got home, lucky I made it. I plan to put skid plate under where your feet go. Congrats on the new trooper. Good to see your sticking with them. Keep us posted on how it works out. Going to DMV to get a license plate for it today so I can drive it the street today, then I'll be taking it up the canyon for a ride today, with out the hood, I'm putting a hinge on it so it opens from the front, but my parts aren't here yet, will photo it and add it to my google drive as I progress, also plan to add a heater to keep my feet warm, anyone have any good ideas of how to go about this? I'm planning to conceal it in the center divider, pull air in at the top and blow it out both sides on our feet. At one point i was looking at adding a heater also. I thought of installing them in the storage area under the seats facing forward and cut openings for the hot air to blow forward towards our feet. I was looking at heaters simular to the one i placed a link for below. A few more fixes, another modification, yesterday I noticed that if I turned the wheels either way to the locks, the tire rubbed the brake lines, so to fix it I needed to twist the lines so they would roll away from the tire instead of into the tire. To do this, I decided to remove the brake caliper and rotate it. It worked. To get to the calipers, I had to remove the tires, to remove the tires, I had to remove lug nuts, and that took a breaker bar and a 3 foot cheater bar. Joyner needs to learn about those torque limiters for impact wrenches. My 2008 Trooper had the lug nuts on so tight it needed a breaker bar also. I also put a hinge on the hood with 2 knobs to hold it down, works good so far. Look at the last few photo on my google drive. Congrats on your new trooper!! I'm watching...want to know how you like it. Taking it to the sand dunes tomorrow, but so far, it's been great, not even going to have to stretch it like I did the 2008 Trooper. I went to the Sand Dunes and had a good time, the suspension was a lot better than what I have on the 08 and the power is a lot better, but then the engine is new too, I also did some riding in the mountain area which is actually my preference and followed one trail until it came to what looked like a treacherous down, I was alone, so I chose not to go down it, Later I went to the bottom of the trail and went up it and turned around and came back down, the Trooper is very sure footed and stable on uphills and side hills. I did have one little mishap though, I was ripping a narrow whoop de do tail and got side ways a bit and snagged a sage brush and cracked a rear fender, bummer. I asked Brandon if he had any in stock and he didn't have one in blue, but said to sand down the area around the crack and epoxy it with JB Weld. So I'm in the process of fixing that and finishing other modification and additions, I opened up a new photo album here also. http://www.utvboard.com/gallery/album/146-kinarfis-new-blue-2015-trooper-t/and I took a whole bunch of photos for myself of it new and untouched for future references in case I need to see how it was in the beginning. To me, the Trooper is a unique machine, hope it's around for a long time! Here's another mod you may or may not be interested in, if you have a fan that turns on & off, it keeps the fan running all the time, but at a slower speed so it comes on less. I did this because the new Troopers like mine have the radiator up just behind the seats, it's not really that noisy, but I could, so I did. Awesome to hear. Just awesome.